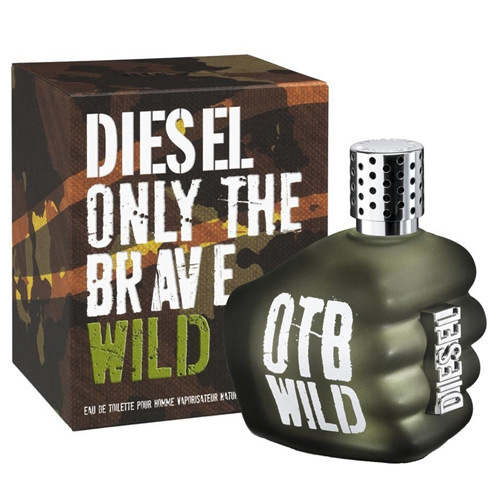 Diesel Only The Brave Wild is a symbol of victory and strength. Diesel Only The Brave Wild 75ml. EDT is a symbol of victory and strength. This perfume is made for bold and determined men who are not afraid to take risks. They know what they want from life and they are going for a hard step. Men's Eau De Toilette Spray Diesel Only The Brave Wild has a very intense aroma that can get your attention when you enter the room. First of all, juicy grapefruit tones, which blend in with fresh citrus, will refresh you. Spicy pepper adds the scent of excitement and attraction. A unique essence composition is also found in the heart of this unique fragrance. Captivating geranium, together with lavender and coumarin, creates a very seductive atmosphere. The nutmeg gives the scent a surprisingly fine aura. The wood base is made of cedar wood, coconut milk, vetiver and silk moss, which glitters the refreshing dew drops. This creates a sparkling refreshing aroma that perfectly complements you throughout the day. Only The Brave Wild has the courage to be alone. He does not have to worry about himself and stands behind his opinions in every situation. He is self-confident, charismatic and attractive. His power is hiding primarily within him. A wild, irresistible man, a real macho and an ideal male is the dream of many women. Before his pressure, whole nations are submitted to their will and voluntarily surrender to the beauty of a beautiful woman. This hero just need decent accessories. Eau de toilette Diesel Only The Brave Wild Diesel is a perfume with a character that perfectly fits with the temperament of a predator. The aroma is characterized by a harmonious combination of citrus motifs and spices. The initial notes are full of freshness of grapefruit, sour lemongrass and fragrant bitterness of black pepper. Enjoying this sound, in the first place is an exciting lavender, nutmeg, sweet, bitter geranium and amazing coumarin. Combining with the original sound, this ensemble captures with its power and complexity. And when, it would seem, you no longer be surprised, there comes a dense coniferous cedar, a dull haze of vetiver, the moisture of the moha and the sweetness of coconut water. Eau de toilette Diesel Only The Brave Wild Diesel is designed for courageous, irresistible men who trust their instincts and clearly go to their goal. They are charming, able to feel people and act decisively, choosing the most effective tactics for a particular situation.